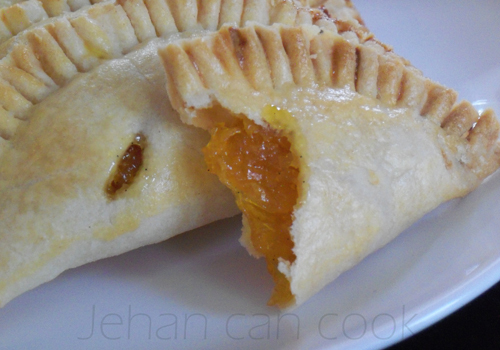 Tender flaky crust with a surprise filling. I love these tarts! Pumpkin jam and tarts have been in my family ever since I was a wee little lass. When I decided to share this recipe with my blog family, I asked my mom about how these tarts came about. She explained to me that many, many years ago there was an abundance of pumpkin in Guyana and the people were tired of cooking it the same way over and over. So the local newspapers printed some new ways in which to use pumpkin and these tarts were one of them. My mom tested the recipe and we all loved it! I loved pumpkin tart before I even knew or had a bite of pumpkin pie. This was the only sweetened pumpkin dish I’ve had up until pumpkin pie, so it was new to us but we loved it anyway. 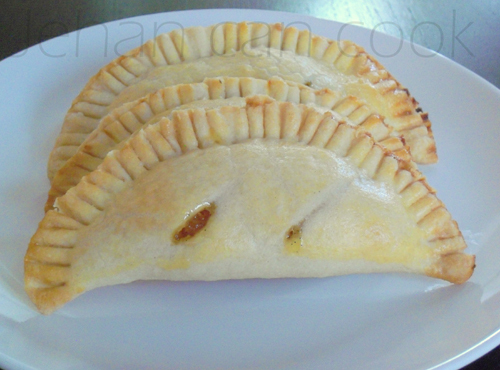 To all my Guyanese who are not familiar with this, if you love pinetarts you will love these! Usually pumpkin is used in fall or winter dishes but this is very light and has a hint of citrus flavor so I think it will compliment your summer menu at your next picnic. P.S. 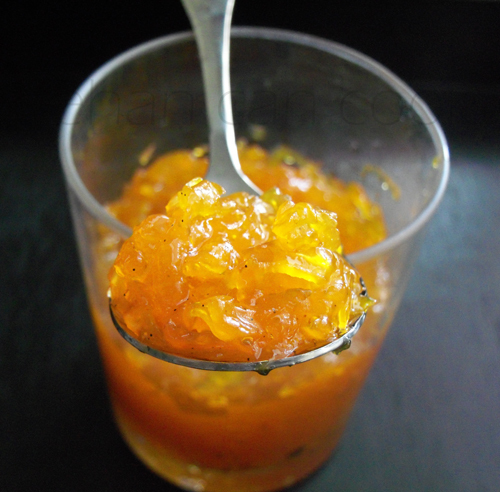 The jam is delicious and great with fresh bread or crackers. Place pumpkin, lemon juice, sugar and water into a pot and stir well. Over medium heat cook for 50 mins or until pumpkin is tender, stirring occasionally. Remove from heat and stir in vanilla. Allow to cool. Mix flour and salt together in a bowl. Using a fork or pastry cutter, cut butter and shortening into flour until the mixture resembles coarse cornmeal. Add 3 tbsp of water and mix until well combined. Wrap in cling wrap and refrigerate for at least 30 mins before using. Prepare egg wash but beating egg yolk and water to combine. Set aside. On a lightly floured surface, roll pastry to 1/8 inch thickness. I used bowl about 6 inches in diameter to cut out the circles. Place about a heaping tablespoon of pumpkin jam in the center. Brush edge with egg wash and fold over making a half circle. Press edges with a fork and brush the top with egg wash. With a knife make two slits across the top to let out steam, this will prevent the pastry from bursting. On an ungreased cookie sheet, bake for 20 mins or until golden brown. Ahhh, this brings back memories. This has always been one of my absolute favorite desserts. If I wasn’t on a diet, I’d make some lol. Is it already time for pumpkins again? yay! I love pumpkins and this jam looks so inviting! Hey, reading your story on how this recipe came about made me realize that a lot of Guyana’s strange recipes came from the people being bored of eating the same thing repeatedly. What a creative people we are. Yum!!! It is about that time for pumpkins. We’ve never had pumpkin jam. These little tarts sound perfect! Wow. 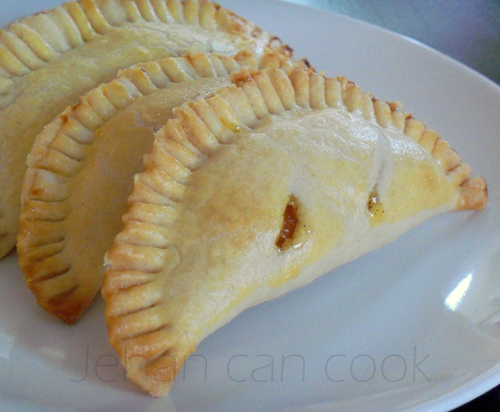 Those look like fried pies. I am so excited by how much they resemble fried pies. Except not fried. But still! They look delicious. These tarts are looking absolutely scrumptious! The pumpkin jam filling sounds awesome! Dianna in Nevada City, CA. I just wanted to let you know that I love your website! I have made several items from your list of recipes! All turning out amazing! Thank you so much for being so awesome! Having the patience to be so detailed really helps me to make sure that I am doing everything right! Just curious, I am going to try to make your recipe for beef patties and I noticed that for the pastry recipe given in your list of ingredients you don’t have salt listed, but in the instructions on how to mix you have salt. So I was wondering do I put salt in the pastry a pinch? Please let me know! Hi Tasha, it’s just a pinch in the dough, about 1/4 teaspoon. I will correct the error, thanks for spotting it and notifying me and thank you for visiting!